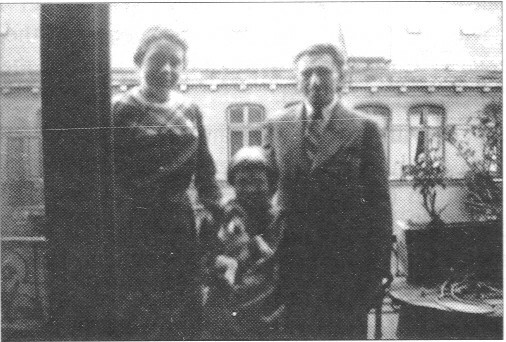 The Proskauers had given Irene a horne during the war to save her from extermination. Herr Proskauer wanted to keep Irene with them after the war, but his wife did not. There were often arguments. Irene did not know exactly what they were about, only that she too was one of the reasons for them. 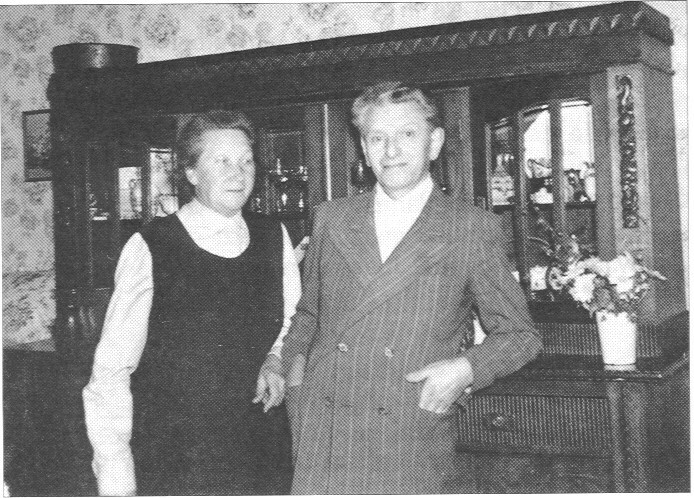 The foster mother's relatives who had been driven out of East Prussia moved in with the Proskauers. Frau Proskauer's mother, "Oma", never spoke to Irene and let her know that she did not approve of her being there. She poisoned the atmosphere in the family. The foster mother was completely dominated by her. The foster father withdrew more and more and was very seldom at home. Now, Irene was often told that she was stupid, lazy and greedy and would have to go. "Oma" had the balcony room. This had been intended for Irene and was always presented to the welfare worker as though she lived in it. To prevent anyone knowing about this, she was rarely allowed visits from other children. The foster mother now came to regard the child as a burden and what had happened had certainly made Irene feel insecure. She cried for the slightest reason (Crybaby ! ), was afraid of being separated, slept badly, and the years of poor nutrition caused constant skin problems, including neurodermatitis. The foster parents registered her for school. 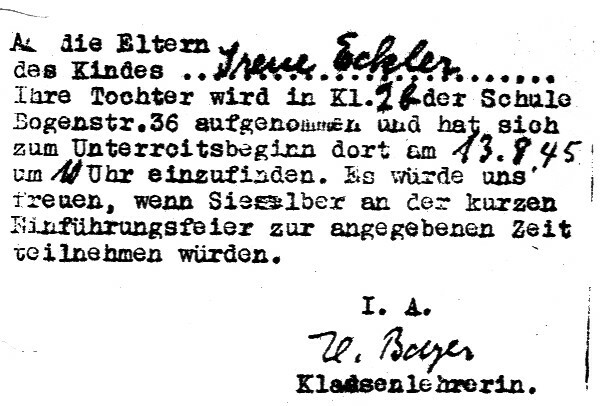 Jewish children had been forbidden to attend German schools since 15th November 1938, and Irene had not had any lessons in Calvörde, either. As she was particularly small and suffered from malnutrition, she looked much younger than she was and it was understandable that the foster mother had not sent her to school there. The headmistress in Hamburg, an ex-Nazi nob, did not want to accept Irene, already eight years old, in the Jahn School. The foster father had to persuade her that she was obliged to accept her. On 13th August 1945 Irene started school in the second grade. "To the parents of the child Irene Eckler Your daughter is to attend class 2b at the school at Bogenstr. 36 and is to be present when lessons begin at 10arn on 13th August 45. We would be pleased if you too could be present at the short opening ceremony at the time given. p. p. Class teacher"
Irene was now expected to sit quietly on the school bench together with the children from the Rappstraße area who had previously called her "Judenschwein" (Jewish pig), she in turn had called thern "Nazischwein". They did not do anything to her anymore, but they did not let her into their circle, either. The foster parents were able to arrange that she went to another school, further away, in Mittelweg, where the children and teacher did not know them. At horne and at school, Irene always had the same experience as during the war : she was not wanted, she was rejected, she did not belong.